Another week flies by – has it passed already? It seems all I can do to keep up some days. Here is the other half of last week’s miscellaneous collection, along with a few new additions from this past week. Our swimming pool was closed up this weekend and drained today. The owners of the house had it going earlier this season, before Dan and I moved in. Neither Dan nor I are avid swimmers, though I do enjoy paddling in warm water. However, the weather was so cool and rainy this summer, the pool never warmed up, and it only got hot enough for me to even consider it on a couple of occasions. Rather than waste the energy in keeping it up, we advised our landlord that it might just be best to drain it. It will be missed by the frogs, who had discovered this watery oasis in the middle of our pondless meadows. Our peak count was seven individuals. We tried removing them at one point, walking them back half a kilometer to the neighbour’s pond, but within a couple of days new ones had moved in to take their place. Surprisingly, they didn’t seem to suffer from the chlorinated water (very low levels, but still), and they probably loved the bonanza of insects that got caught in the pool and drowned. They would haul themselves up on the hose of the kreepy krawler. Raven had a blast running about the pool edge, peering in at them, she’d go to the pool gate and sit and whine for us to let her in. 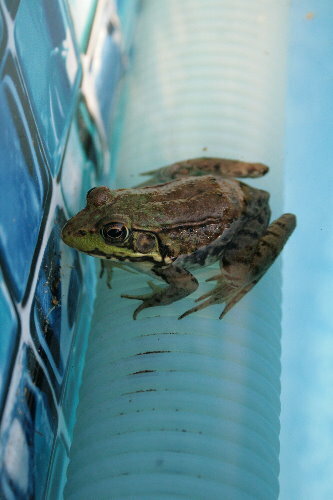 We mostly seemed to have Green Frogs inhabiting the pool, identified by their green upper lip and dark bands across their back legs. August was our first “repeat” month in eastern Ontario, since we moved out of Toronto to the lake house for Aug 1 last year. It’s been interesting to see some of the same observations we had last year turning up again this year. 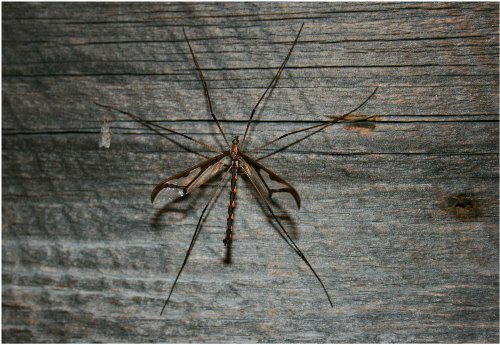 One example is this giant crane fly. Almost three inches from foot to foot, it’s got to be the biggest crane fly species I’ve seen. We had a couple around the house last year, including this individual. It’s a Giant Eastern Crane Fly, Pedicia albivitta. They’re attracted to artificial light, and we’ve been seeing them regularly at our porch lights. This repeat goes back to spring 2008. I found a similar cocoon stuck to my parents’ windowsill last winter, and later saw many at the research station. Since that initial observation, I’ve also seen them on the outside walls of the lake house, and now around here, including on plants in the meadow. 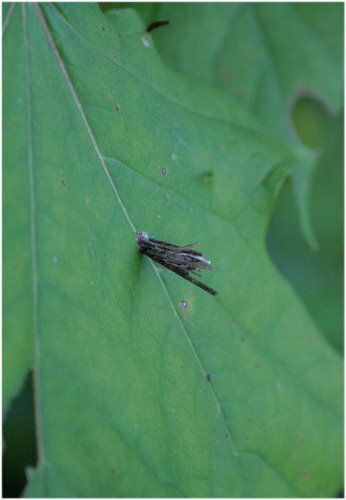 They belong to a bagworm moth, probably Psyche casta, a species whose females fashion these stick cases like caddisflies and then never leave them. They mate with males and then lay their eggs all within the confines of their case. Once the female has mated, she secures the case to a surface with a sticky pad of silk, and then dies. The case in this photo probably no longer had a living adult in it, though I didn’t try taking it off to check. 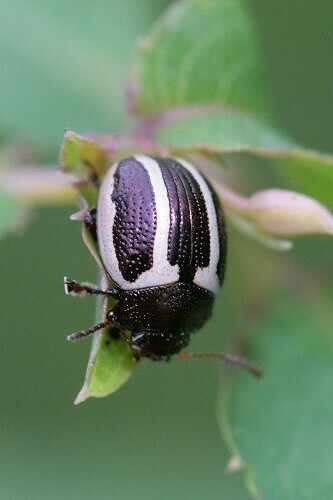 I spotted this strikingly-patterned beetle on a plant at my parents’ new place while housesitting last weekend. It’s a leaf beetle, and I foolishly neglected to pay attention to what species of plant it was on. Since leaf beetles tend to be very closely associated with particular types of plants (such as the Three-lined Potato Beetles or Clavate Tortoise Beetles on my Chinese Lanterns in the spring), knowing the plant species would have helped with identification. Still, I suspect it to be a Ragweed Leaf Beetle, Zygogramma suturalis, which feeds, unsurprisingly, on ragweed, a pretty common plant around here. 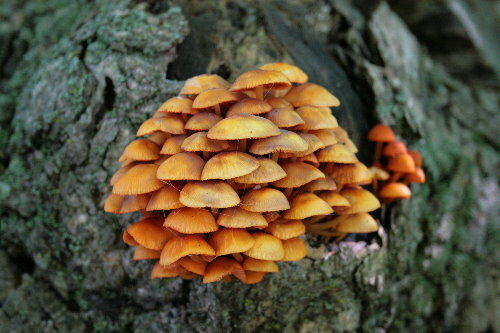 I found this brightly-coloured clump of fungi on an old stump in one of our small stands of trees out in the middle of the meadows. From the photos in my mushroom guide I think it’s Mycena leaiana, a fairly common and widespread bright orange fungus that is usually found in clusters on stumps and logs. It’s considerably larger than other Mycena species I’ve encountered, and was particularly eye-catching, even through all the foliage. I found this lovely flower in the woods at my parents’ place. 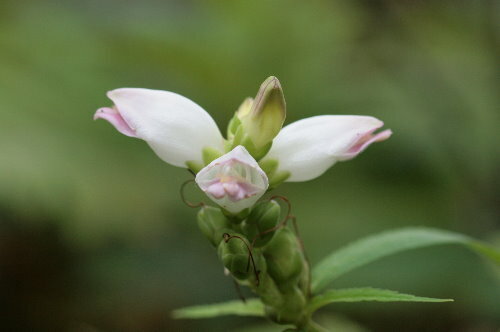 Of course, after posting the white mystery flowers last week, I knew what these ones were: White Turtlehead, Chelone glabra. It’s a very common, widespread species that enjoys wet soils and is found blooming this time of year. It’s a host plant for Baltimore Checkerspots, which we’ve seen lots of in the wet woods at the back of our meadows where I found that first one. I noticed under our birdfeeder the other day that some opportunistic seeds had sprouted. Two of them had got quite large. 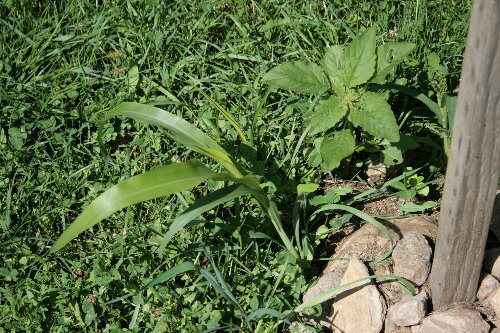 I think the one on the right is a sunflower; I did notice a few other younger sunflowers hidden in the long grass. The one on the left, of course, is corn. This one rather surprised me, I didn’t think that the corn packaged in birdseed mix was actually viable. But apparently so! I don’t expect that it will get large enough to actually produce ears before the frost this year, but I’m impressed by its tenacity nonetheless! Next Next post: Won’t you come and bird with me?